Sister Barbara (Michael) Sandor, CSJ, 83, died Wednesday, December 21, 2016, in the 65th year of her religious life as a Sister of St. Joseph. The daughter of Michael and Anna Semens Sandor, Sister Barbara entered the Congregation from Holy Rosary Parish in Pittsburgh. From 1955 through 1978, Sister Barbara served as a teacher in the Pittsburgh, Altoona-Johnstown, and Greensburg dioceses. Her school ministry sites included Annunciation in Pittsburgh (1976-78), Nativity in Pittsburgh (1970-76), St. Cajetan in Monessen (1964-69), St. Mary in Freeport (1962-64), and St. John in Johnstown (1960-62). 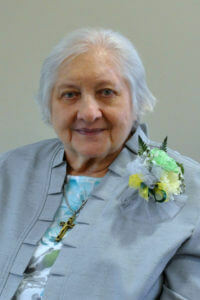 Following her teaching ministry, Sister Barbara held several secretarial positions, including at the Diocese of Pittsburgh Religious Education Learning Media Center, Good Samaritan, Annunciation, Duquesne University and Mercy Hospital. From 2006-2012, she served as a volunteer visitor at Villa St. Joseph where she has resided for the past four years, participating in the Villa Voices, Bell Choir, and Pets with Heart therapy. Sister Barbara is survived by a sister, Helen Sandor; a brother, Joseph Sandor; nieces, nephews, grandnieces and grandnephews; the Associates and the Sisters of St. Joseph of Baden. Friends will be received Tuesday, December 27 from 1- 8 p.m. and Wednesday, December 28 from 11 a.m. – 2:30 p.m. at the Motherhouse of the Sisters of St. Joseph. Prayer Vigil will be Tuesday, December 27 at 6 p.m. at the Motherhouse. Mass of Christian Burial will be offered Wednesday, December 28 at 3:00 p.m. Burial will follow in the Sisters’ Cemetery on the Motherhouse grounds. Donations in the name of Sister Barbara may be sent to the Sisters of St. Joseph Memorial Fund, St. Joseph Convent, Development Office, 1020 State St., Baden, PA 15005. Make a donation in memory of Sister Barbara.